S. The second set of poems from 1905—1908; when Iqbal studied in Europe and dwell upon the nature of European society about whom he emphasised had lost spiritual and religious values these inspired Iqbal to write poems on the historical and cultural heritage of Islam and Muslim community with the global perspective. 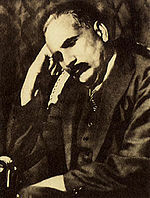 Iqbal consistently criticised feudal classes in Punjab as well as Muslim politicians averse to the League. Sir Muhammad Iqbal (Urdu: محمد اقبال‎) (November 9 1877 – April 21 1938) also known as Allama Iqbal (علامہ اقبال) was a philosopher poet and politician in British India who is widely regarded as having inspired the Pakistan Movement. In 1922 he was knighted by King George V giving him the title "Sir". He is also called Muffakir-e-Pakistan (مفکر پاکستان "The Thinker of Pakistan") and Hakeem-ul-Ummat (حکیم الامت "The Sage of the Ummah").